Read-out Instrumentation Signpost: Spectrum analyser. A new Spectrum Analyzer MS9740B has been developed by Anritsu, for evaluating the output characteristics of optical active devices used by optical communications systems. 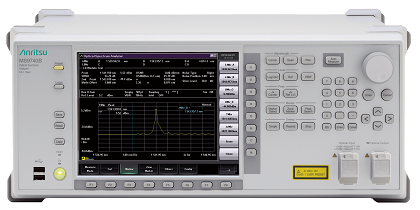 The instrument keeps the same measurement-sensitivity performance, functions, and size as the predecessor MS9740A while shortening measurement processing times by 50%, further improving production-line efficiency by optimizing the Spectrum Analyzer MS9740B optical receiver bandwidth settings, most commonly used by customers. This performance upgrade slashes optical active device inspection times and increases mass production-line efficiency. The spread of next-generation 5G mobile and Cloud communications services is expected to increase data traffic volumes massively. Networks supporting this infrastructure are experiencing explosive jumps in network traffic, which demands both increased module production and shorter inspection times to allow in-time delivery required for the rapid expansion and adoption of faster rate optical modules at 10G, 100G, and 400G bit. As well as keeping the same functions and performance as its predecessor, the MS9740B slashes measurement processing times by up to half (Rx bandwidth setting: 1 kHz or 200 Hz) while overcoming problems of decreased measurement sensitivity caused by increased processing speed. Moreover, the MS9740B retains optical active device (LD-Module, DFB-LD, FP-LD, LED, WDM and Optical Amplifier (NF and Gain) measurement menu screens for evaluating devices. The device supports all-at-once measurements of key evaluation items, such as optical center wavelength, level, OSNR, spectrum width, etc., and displays these results on one screen.